Laima Rickeviciute's first season in playing basketball outside her native country has seen her play in France with Limoges in the Ligue Féminine de Basketball. She will now play in the Italian LegA Basket Femminile A2 (South) with Passalacqua Spedizioni Ragusa. The club is currently in twelfth place with only 4 wins in 16 games. 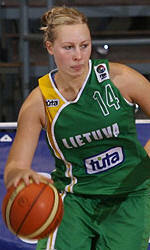 Rickeviciute is just 21 years old and had played previously for Lintel 118 and Arvi Marijampole in Lithuania.